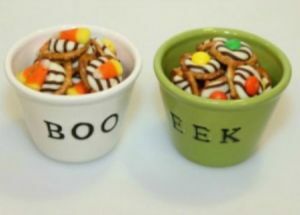 Does anyone know where to get the bowls used for the pretzel candies? They are white and one says BOO and the other says EEK. If you can't find them, you could easily create your own with some plain ceramic cups and ceramic paint. We crafters do things like this all the time. Creepy Halloween Hot Dog "Finger Foods"